about production: Corrugated paper baking mold need glue and it only have semi-auto machine. Ours baking mold does not need glue and it has auto machine So it is much more easy to production the baking mold. 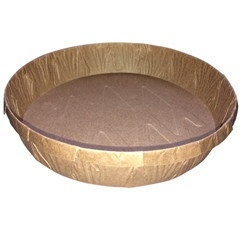 about paper material: the corrugated paper price is USD 0.73/sheet (sheet size is 889*1194mm) the 80g china cake paper is USD 0.147/sheet(sheet size is 787*1092mm) So it can reduce the baking mold price.